It is with decidedly mixed feelings that I write my final Dean’s Message as the inaugural Dean of the Dalla Lana School of Public Health. I am tremendously proud of the School’s accomplishments over the last five years and the progress we’ve made together in achieving our vision: to be the leading model for public health and health system learning, research and service with impact at the local and global level. Sabbatical beckons — it’s my first in 16 years, and I’ll be in Seattle with my family starting this August, with more time on my hands to advance some research and translation projects (from afar) with DLSPH faculty and students, start some new projects with colleagues at the University of Washington, and enjoy the Pacific Northwest. And yet, there is so much that I am going to miss about the School and my day-to-day interactions with each member of our community. Most of all, I will miss hobnobbing with our fabulous students, which deserve special mention. I am amazed by their boundless commitment and passion. For example, every year since I arrived, numerous students have received a Gordon Cressy award, one of the university’s highest honors for community building and volunteerism. This spring, competing against 23 other world-class public health schools, an interdisciplinary student team took home second place and the Participants’ Choice Award at the Emory Global Health Case Competition. I am proud of our students for showcasing our collective social mission via the annual student led conferences, which over the past few years have explored environmental health, basic income, racial justice and this year will tackle Indigenous health and colonization. This year’s student-organized IHPME Research Day brought together health system leaders around achieving health system change. Our students are critical in achieving our mission of having an impact on health locally and globally, and training and launching them into the world arguably represent our greatest legacy. Allow me the privilege of a bit of recapping. Since my arrival in July 2012, the School has embarked on a remarkable growth trajectory which every member of our community should take immense pride. In 2013, DLSPH became the University of Toronto’s first new faculty in 15 years – a major accomplishment, given the University’s traditional structure. That year we also launched the Division of Clinical Public Health, led by Professor Ross Upshur, which is one of the first units of its kind globally that connects public health and primary care. The Office of Global Public Health Education and Training opened its doors, started building global health partnership platforms and launched its research travel awards program in 2013 as well. Now led by Professor Erica Di Ruggiero, it has become a terrific resource for students and faculty embarking on global scholarship. 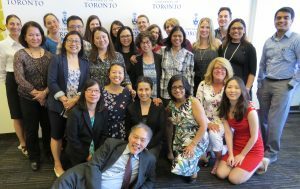 In 2014, we strengthened our administrative structure by opening our first Advancement and Communications Offices, now led by Annette Paul and Nicole Bodnar, who are building our School’s profile in Toronto and globally. It was also when IHPME transitioned into DLSPH, collectively creating a global powerhouse with a shared vision of improving health and health systems. If it wasn’t for the leadership of Adalsteinn Brown, Andrea Sass Kortsak, Rhonda Cockerill, Robin Hurst and all the transition committees, this would not have happened, and I am extremely grateful for everyone who supported this development in DLSPH’s evolution. The first endowed Indigenous health institute globally was also established in 2014, named the Waakebiness Bryce Institute for Indigenous Health the following year, highlighting Indigenous health as an important priority for both DLSPH and the University. I am grateful to the generosity of Dr. Michael Dan, the Institute’s benefactor, and Professors Jeff Reading, Earl Nowgesic, Anita Benoit and our first permanent director, Professor Suzanne Stewart, for their inspired leadership of the Institute. After a year and a half of planning led by Professors Abdallah Daar, Alex Jadad, Ross Upshur, and the Summit’s Executive chair, Rani Kotha, our Institute for Global Health Equity and Innovation also hosted its remarkable 2014 Global Health Summit, which established a suite of innovative initiatives that the Institute continues to pursue today. In 2015 under the leadership of Professor Jennifer Gibson, DLSPH welcomed the University of Toronto Joint Centre for Bioethics into our Faculty, signaling the evolution of bioethics as a field expanding in scope to address both upstream social determinants of health and downstream implications on patient care, health policies and population and global health. It was also the year the Centre for Evidence and Health in all Policies was established under Professor Brown’s leadership, a crucial unit that enables researchers to affect policy change. It is evident that our international colleagues agree that the DLSPH is well on its way to achieving global recognition and impact. Together, the recommendations and priorities uncovered in the strategic planning and external review exercises have charted a bright future for the School. They also were the products of a tremendous amount of work for a number of people and I want to thank, in particular, Professors Adalsteinn Brown, Daniel Sellen and Melodie Buhagiar for expertly stewarding us through these major milestones. Guided by our strategic plan, I am confident that the Faculty will meet and exceed the recommendations outlined in the external review and make significant contributions to the health of Torontonians and beyond. To be sure, there are a number of challenges to overcome, including securing resources — people, financial and space — for our students and faculty and differentiating us from our competitors. And make no mistake, competition is heating up — for example, McGill University just committed to launching a school of public health, and York University is steadily building its new Institute of Global Health. But there are also many opportunities for our Faculty to continue its rapid trajectory of development, particularly in the context of our many partnerships and initiatives that will continue to build and enhance our brand. As I transition into my sabbatical as a regular rank-and-file Professor, I look forward to continuing and expanding collaborations with many of you on projects such as our Exposomics and Big Data for Population Health initiatives, our First Nations cancer and the environment study, and new projects related to public health entrepreneurship. I’m sure they will keep me busy and it will be a pleasure to keep my connections with the School. In the meantime, I wish you all a productive, but also thoughtful and relaxing summer, filled with renewed friendships, love and joy. And please keep in touch— my personal email address will remain: howard.hu@utoronto.ca. Howard and PHS staff at the spring convocation lunch on June 14, 2017.